Steve Coogan is not in a good mood when he speaks to Sky News about his latest film Stan & Ollie – in fact he has just been handed a speeding fine. But despite the points on his licence, it is not all bad news for the 53-year-old actor, who has been nominated for a BAFTA for his portrayal of Stan Laurel. 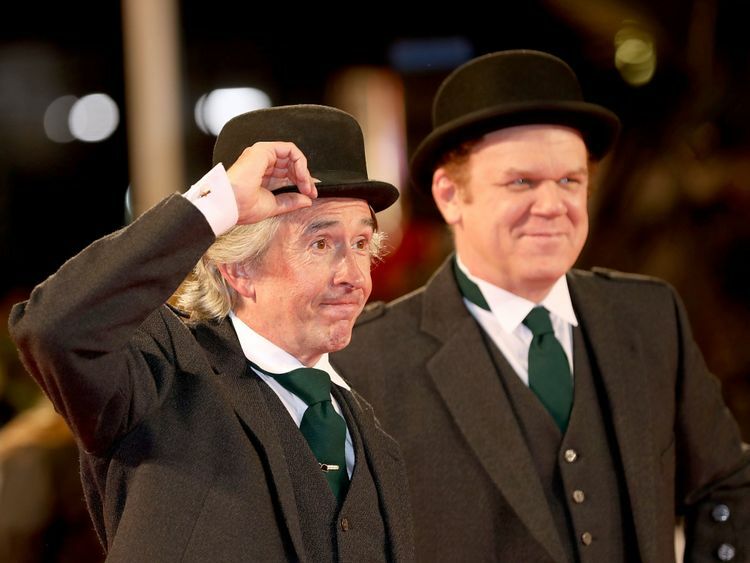 Starring alongside John C Reilly – who plays Oliver Hardy – Coogan said getting the partnership right between the two comics was key to nailing the part. Stepbrothers star Reilly could not agree more. He added: “If you’re constantly gunning with each other to be the top dog, it might be interesting and funny but it’s not a very fun day at work, you know? While the stage personas of Laurel and Hardy are widely known – with Hardy taking charge while Laurel creates the mayhem – their relationship behind closed doors seems to have been quite the opposite. Director Jon S Baird, whose last film was Irvine Welsh’s Filth, explains that was part of the reason the film showed the men at the twilight of their career rather than their heyday. Describing the biopic as “a love story with comic elements”, Baird explains: “We set out to make a film about two old friends who are coming towards the end of their careers and they realise that what’s most important is each other. So why is the story of two performers – whose heyday was back in the 1930s – still relevant today? Coogan said it was all down to the endurance of their work. “It sets the template for a lot of comedy now,” he said. “You watch their stuff and it still makes you laugh. Reilly concurs: “Laurel and Hardy are timeless to us. And each generation since they made their first films has come along and said, ‘You know what, these guys are still valuable to us’. So their legacy was kept going all this time. “Now Steve and I are in the wonderful position of bringing their legacy to a younger audience, to the YouTube generation. “When we were kids we watched them on television, and then there was the videotape generation and now all of Laurel and Hardy’s work is on YouTube. “It’s one of the great joys of doing the film – not because we’re nostalgic for Laurel and Hardy, or we like the 1930s, but because their work still works as comedy. With three BAFTA nominations in the bag, and Oscar nominations still to come, it is unlikely that Google searches for “Laurel and Hardy” will be declining any time soon. Stan & Ollie is in cinemas now.